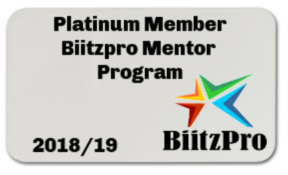 The Biitzpro Suite of Services... ALL DAY training day [or 2 half days] $4,997 plus travel from Perth and accommodation if required The Modern Elder coaching package $1,250 a month for 12 months $15,000 per annum The Rebootology Coaching Package $1,250 a month for 12 months $15,000 per annum The Chief Marketing Office service as an application $2,000 a month for 3 months $6,000 The Power Audit Once off fee of $995 The monthly support package $100 a month $1,200 And to have access to all the services there is a Platinum Member or INNER CIRCLE MEMBERSHIP which allows you to pick and choose what you want [ or have some of everything ] Important Note: All these services will be officially offered from January 1st, 2019 at full price. Rebootology - what to do now... advice and assistance in building recurring income to support a life after mainstream work. Presentations: Whether for your company, your association or a live in retreat, a key note address. What will you get? In all case there will be a Step 1 involving the completion of our unique POWER AUDIT which is send you for completion. After completion of the audit, either personally or for your company, we will togther plan the best way for us to proceed. Wondering what al this means? If this offer isn't for you but you can think of someone it would suit... please forward this email on. In case your maths aren't as good as they could be Onr of the support package [ $15k ] plus a days training [$5K] plus the PowerAudit $1k] and the monthly support plan [$1.2k] would total $22,200 so this is less than 5% of that.... I think that is a fantastic offer and you will see why it is limited in time and in number. WHY AM I DOING THIS - I NEED A CORE OF MEMBERS FOR THE INNER CIRCLE TO WORK. Plus who doesn't want to get a ONCE IN A LIFETIME chance to be part of something bigger!